Loosening its grip further on the battle royale space, PlayerUnknown's Battlegrounds' generated around one third of the revenue across both platforms in its first week of monetisation on mobile compared to the iOS-only Fortnite. Both Fortnite and PUBG arrived on mobile in March, but PUBG only began monetising last week. 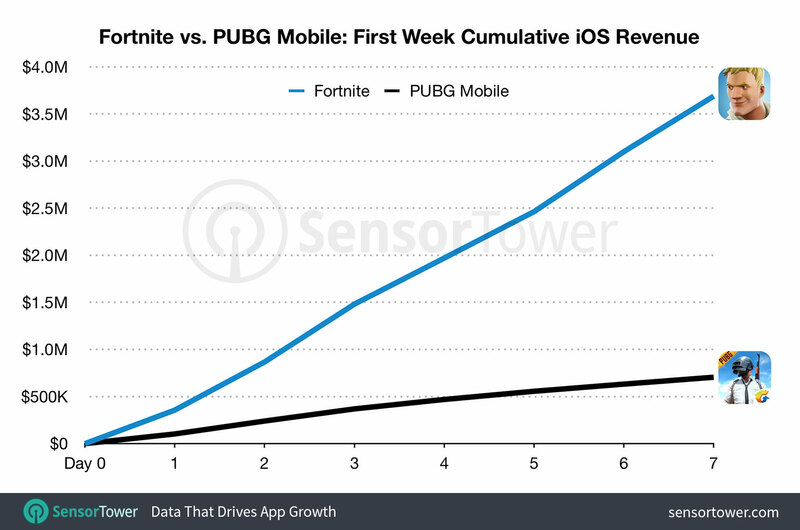 Comparing the respective first weeks of monetisation for both games, mobile intelligence firm Sensor Tower discovered that spending is substantially higher in Fortnite, despite having only a fraction of the downloads. Looking at the same set of countries -- both excluding China-- Fortnite generated five times the iOS revenue than PUBG in the first seven days of monetisation. Even though Fortnite is currently limited to Apple devices, it still generated $3.7 million in its first week, dwarfing the combined Android and iOS revenue of PUBG, which comes in at around $1 million. Additionally, Fortnite is pulling in more cash from less users. Epic Games' battle royale launched as an invite-only app and peaked at only 3.7 million downloads during that first week. PUBG, however, accrued 22 million downloads by the time it began monetising. The stark difference could be down to the means of monetisation, suggested Randy Nelson, head of mobile insights at Sensor Tower. "There's also the possibility that the way Epic Games has structured its purchases may be giving Fortnite a leg up on its biggest competitor," he said. "It offers limited-time costumes and set daily items that players can purchase outright, as opposed PUBG Mobile's primary use of loot boxes that produce random (and often duplicate) items when opened by players."